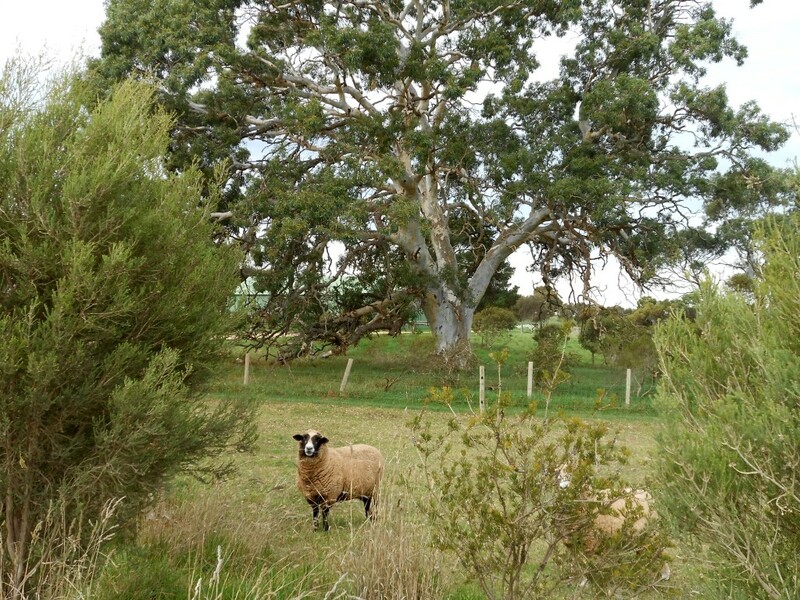 Last year I wrote about this mightiest gum tree, one of my dearest loves from the first day I saw him, along with the only picture I have of our farm with my old friend as part of the scene. The story was called ‘Now THIS was Awesome‘. I’ve just re-read my article and really don’t want to change a word. I think I truly captured my deep love for that old fellow. But what I do want to share is a couple of the recent photos another old friend who lives closer kindly took for me. I was almost afraid to ask her, in case the finding would be that he was gone. But Hallelujah, he lives! And he’s still surrounded by all the space and beauty exactly as I knew him. He’s one big fellow to fit into a photo, especially if the photographer needs to include the ‘lurkers’. Bet they’ve spent an hour or three under the shade of his great sheltering arms – I certainly have. And that gentle giant trunk has been hugged, and prayed alongside, and his bark holds a bucket of tears, too. Look, here he is again. What’s not to love? Even the woolly wannabes add their charms. Welcome A.K. I have seen taller gums… in the Valley of the Giants in Western Australia, and maybe older… in Tasmania, but the grandeur of this ‘Grandpa Gum’ stole my heart from Day One. Majestic and stately are good words to describe the tree. I love how certain old trees become beloved landmarks. Mmm… just imagine being a landmark for upwards of 400 years! Impressive! It is amazing, the time it takes for a tree to grow. All the factors that are needed, sunlight, soil and proper amount of rain all have to be correct for it to grow tall. Then some guy with a chainsaw can end it in minutes. Our nearest volcano is only 50kms away, and is considered a ‘youngster’ in Aussie recorded eruptions – its last one believed to have been 5,000 years ago. Because of that and because it’s filled with the most glorious colour of water through the late spring and summer months, it is aptly called The Blue Lake. Cannot imagine living without natural beauty surrounding us. I remember reading your initial article about this tree. An awesome force of nature. As a child I remember reading a book about a redwood in Northern California. The book gave human life to the tree and followed its journey from sapling to maturity. It conveyed to the reader all the times and events the tree had witnessed. I am sure your gum tree would have some stories to tell. Now there is food for thought Tim. Can we begin to imagine how many feathered lives he has sheltered and nurtured? And all manner of other life, too. Yet another gum nut planted in the fertile soil called ‘grey matter’? Majestic is indeed the right word. Good to see he is still there. On the east coast of the U.S. we’ve had a lot of rough weather in the last few years and it has cost us some of our grandest trees. Of all the things a hurricane can blow away, a big, mature tree is one of the least replaceable. Kind of have that in mind today as we brace ourselves for a blizzard. I hope your most beloved trees stay safe, Ken. Guess all we can ever do is be thankful for whatever time we can share with our gentle giants. When I started reading about this Gum tree I remembered your last post about same tree then I hurried back to last post and saw my comment there as well. It is nice that someone can pass you the memories and pictures of something that is very dear to you and part of your life. The tree is huge and beautiful. I love the new pictures. Yes, they are special photos Andleeb, and such a kind friend. Animals in the wild, lovely trees to give them shade, grass all around to feed them. Sounds like they have a blessed life. Amazing how nature takes care. Pat, that is exactly what has kept us farming for 40+ years, inspired by the awe of Mother Nature at work. Such a wondrous lesson for humans. Christine, I love these photos – especially the second one with the sheep – We have huge maples around our house and can’t imagine what our place would look like without them. Aren’t we lucky to be surrounded by such beauty. Lenie, here in Australia many people fear the danger of falling branches from gum trees, and rightly so. And yet… when I think of the refuge for untold numbers of birds, and shade and shelter and comfort for all animal life (including us), I’m ready to take my chances. After all, is this not a reflection of Life itself?